Saints and Feast Days this week. Beginning Sunday, 14th October 2018 - The Twenty Eighh Sunday in Ordinary Time. Lectionary - Sundays Year B, Weekdays Year 2. Memorial of St. Teresa of Avila, Virgin and Doctor. 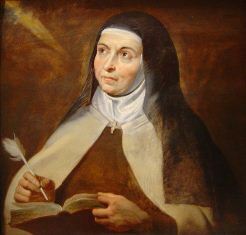 The foundress of the reformed (Discalced) Carmelites, Teresa was born into and aristocratic Castilian family in 1515. When convalescing from an illness she happened to read the letters of St. Jerome and decided to enter religious orders. And at the age of twenty she entered the Carmelite Convent of the Incarnation at Avila. She found the atmosphere there relaxed and after twenty-five years she expressed a desire to found a house where the primitive rule would be more strictly observed. Despite initial opposition the house of St. Joseph at Avila was founded in 1562 with thirteen nuns in conditions of poverty, hardship and solitude. During the 1560s, in association with St. John of the Cross, she was active in the reform of the Carmelite friars – a task that was not without opposition but eventually they were recognized and awarded an independent juridical structure. Both in her lifetime and afterwards the Discalced Carmelite friars rendered invaluable service by providing spiritual direction. Teresa died in 1582 and was canonized in 1622. In 1970 she was declared a Doctor of the Church – the first woman saint so honoured. Memorial at choice of St. Hedwig, Religious. Born into a noble family in c. 1174 when aged only twelve she married Henry, the future duke of Silesia, himself only eighteen years old, who would succeed his father in 1202. By him she bore seven children from whose quarrels and violence she suffered much. 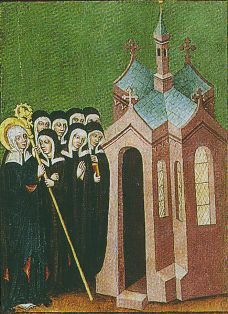 She was prominent in founding religious houses notable those of Friars and a Cistercian nunnery at Trebnitz near Breslau – the first convent of women in Silesia. After 1209 she and Henry lived in continence and on his death in 1238 she took the Cistercian habit, She died in 1243 and was canonized in 1267. Memorial at choice of St. Margaret Mary Alacoque, Virgin. Born in 1647, Margaret Mary Alacoque, after an unhappy childhood, became a nun of the Visitation convent at Paray-le-Monial in 1671 making her profession the following year. Between 1673 and 1675 she experienced a number of visions of Christ. In the last of these Christ revealed that He wished for a feast of His Sacred Heart to be established in reparation on the Friday after the Octave of Corpus Christi. 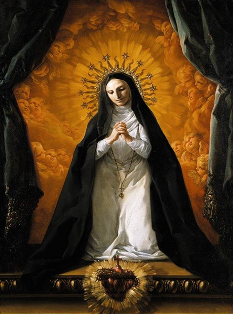 Her request was initially met with opposition and scorn but despite this confraternities of the Sacred Heart became to be established across Europe and he first month of the Sacred Heart was observed in 1833. In 1875, to celebrate the bicentenary of the visions, Pope Pius IX extolled all Catholics to consecrate themselves to the Sacred Heart, His successor, Leo XIII encouraged all Catholics to dedicate the whole world to the Sacred Heart on the 11th of June 1899. Margaret Mary died aged just forty-three in 1690 and was canonized in 1920. 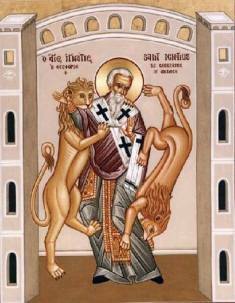 Memorial of St. Ignatius of Antioch, Bishop and Martyr. Of Syrian origin, nothing is known of Ignatius’ early life or his episcopate in Antioch, which it is believed he took over in c. 69, before his final journey to Rome which he made under military guard because he had been condemned to death during the persecution of the Emperor Trajan. On this journey he wrote seven revealing letters that make him a significant witness to Christianity in the immediate post-apostolic age. Four of these were written at Smyrna where he was received with great honour by Polycarp and many other Christians. These were addressed to the churches at Ephesus, Magnesia, Tralles and Rome. At Troas he wrote the remaining three letters to Polycarp and to the churches at Philadelphia and Smyrna. In all of these he reveals himself as ardently devoted to Christ affirming His Divinity and Resurrection and they urge unity in and through the Eucharist and its president, the local bishop. On reaching Rome he met his death in c. 107 by being thrown to the lions in the Flavian amphitheatre – the Colosseum. Letters: Ephesians, Magnesians, Trallians, Romans, Philadelphians, Smyneans, Polycarp. 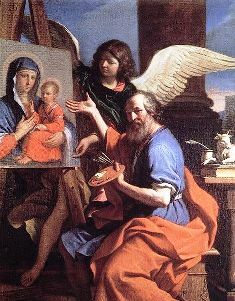 Feast of St. Luke, Evangelist. Almost all that we know about Luke comes from the New Testament where he is described as a Greek physician (Colossians 4: 14) who accompanied St. Paul on some of his missionary journeys (Acts of the Apostles 16: 10 ff; 20: 5 ff; 27-8) and as the author of both the Acts of the Apostle and of the Gospel that bears his name. Tradition has it that he was one of the first members of the Christian community at Antioch and much can be gleaned about his character from his writings. These emphasise the compassion of Jesus Christ together with an emphasis on poverty, prayer and purity of heart make up much of his specific appeal to the Gentiles. Women figure more prominently in Luke’s Gospel than in the others. The Acts of the Apostles shows him to be an extremely accurate observer concerned with making the necessary links between sacred and profane history – many of his observations have been confirmed by archaeology. Tradition also has it that he was a painter and to have made at lease one icon of the Blessed Virgin – according to legend he painted the icon of the ‘Black Madonna’ at Czestochowa. Gospel according to St. Luke. 1009 – The Church of the Holy Sepulchre, a Christian church in Jerusalem, is completely destroyed by the Fatimid caliph Al-Hakim bi-Amr Allah, who hacks the Church's foundations down to bedrock. Memorial in Oxfordshire of St. Frideswide, Abbess. 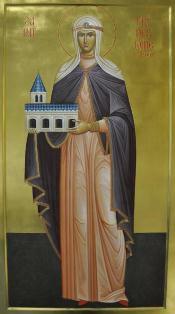 The patron saint of both the City and the University of Oxford, little is known about Frideswide’s (her name means ‘bond of peace’) early life. The earliest account of her life dating from the twelfth century has her as the daughter of a Christian Saxon nobleman who lived in Oxford. She was sought by a Mercian king who intended to marry her. However, she refused and fled to the woods on the banks of the Thames near Binsey where she remained for three years living and working with a swineherd and his wife. Her suitor marched with his army to the gates of Oxford where he was struck blind but later healed by the saint’s intercession. After her exile she returned to Oxford and founded a double monastery, probably on the site of Christ Church Cathedral where she remained until her death in c. 735. Her shrine remained until the monastery was suppressed by Cardinal Wolsey who was seeking funds for the building of Cardinal College (now Christ Church).